To pay by cheque, send a cheque for the full amount including postage (made payable to David Ainsworth) to the address at the bottom of the page together with your name, address, and order request. 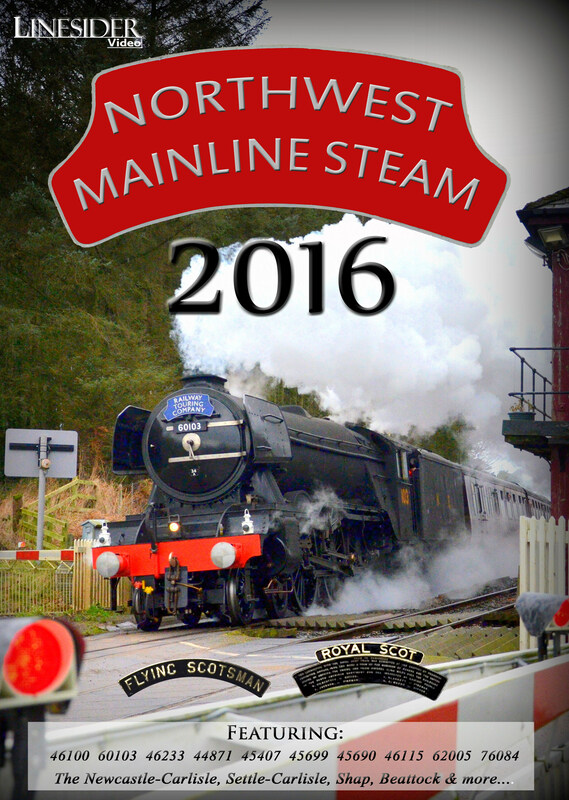 Northwest Mainline Steam 2016 continues the series, with 145 minutes of action from the region's varied routes. Although the S&C was closed from early February, 3 runs over the Long Drag, featuring double-headed black 5s, the Duchess and Flying Scotsman are covered, including interesting scenes around Howe and Co. and Low House of single-line working. The majority of tours over the region's less celebrated but highly worthwhile routes are also included, including an in-depth feature of 60103 Flying Scotsman's Waverley workings over the Newcastle & Carlisle line in the late summer. Bentham, nr. Clapham, Billington (2), Pleasington, Barton, Preston (LE). Greenholme-Shap Wells, Whitehaven, Corkickle, Dalton-in-Furness, Lindal Tunnel. Catterall, Ulverston, Nethertown, Galgate Viaduct. Crawford (2), Beattock, Leaving Beattock (2), Leaving Lockerbie, Castlemilk, Metal Bridge. Rise Hill Tunnel (2), Approaching Shap, Wet Sleddale, Lancaster. Scout Green, Shap Wells, Howe & Co. (extended sequence showing the Duchess propelling its stock onto the Down Mainline and re-starting on the 1 in 132), Armathwaite Viaduct, Armathwaite curve, Kirkby Stephen Station, Bullgill, Hoghton Tower. Greskine, Harthope, Beattock Summit, Crawford, Eden Valley Loops (LE). Hay Fell, Grayrigg Summit, Beckfoot, Harrison's Siding, Shap Summit, Bailrigg. Scout Green, Bessy Ghyll, Lancaster. Lune Viaduct no. 2, Melling Tunnel, Hellifield, Giggleswick Bank/Mewith, Skew Crossing, Langho, Wilpshire Tunnel, Pleasington, Hampson Green, Galgate Viaduct. Scout Green, Shap Summit, Scotby, Eden Brows, Low House Level Crossing, Kirkby Stephen, Mallerstang, Carnforth (LE). Shap Wells (panoramic, lineside), How Mill. Melkridge, Greenhead, Longbyre, Gilsland (2), Fenton, Lane Head, Wetheral (2), How Mill, Cowran Cutting, Hell Beck, Brampton Fell (2), Brampton Station, Milton, Naworth. Preston, Lydgate Viaduct, Copy Pit. Bentham, Clapham Moor, Whalley, Billington, Langho, Pleasington, Preston (6 coaches). Arnside, Lindal Bank, Duddon Estuary, Braystones, Aspatria, Beattock (2), Beattock Summit. Clapham, Hellifield, Lydgate Viaduct (LE). Barton, Galgate, Greenholme, Scout Green (on its 41mph run over the top), Dalton-in-Furness, Arnside. Preston, Galgate, Lambrigg, Scout Green, Lune Gorge, Lowgill. Melling Tunnel, Low Bentham, Skew Crossing, Clapham Moor, Wilpshire Tunnel, Pleasington, Giggleswick Station.